General Topics & Doctrine | Cracking Da Vinci's Code: You've Read the Fiction, Now Read the Facts | Watchman Fellowship, Inc.
Was Jesus merely human and not divine? Did Jesus and Mary Magdalene marry and have children? Is there a Holy Grail? If so, what is it and where can it be found? 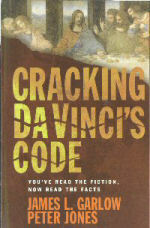 Cracking Da Vinci's Code is the long-awaited answer to these and other questions. Authors James L. Garlow and Peter Jones present compelling evidence that Brown's assertions are not only historically inaccurate, but may also contain a hidden agenda.